One of the greatest Oscar traditions is the "office pool" and Film Actually has put its own spin on it. Most people wait to predict the final winners (when everyone already knows who's gonna win) but we're taking on the greater challenge of the nominations stage! Myself and 33 other LAMB (Large Association of Movie Blogs) member bloggers will be testing our predicting skills in the hope of winning the main prize of a $40 Amazon gift card. 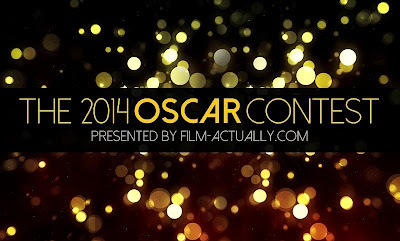 For this 2nd annual Film Actually Oscar Contest, defending champion Lindsay is back, as well as 10 newbies! Be sure to visit all the awesome blogs below. - Your predictions are due by 6PM EST on Jan 15th. They will then be posted here on a spreadsheet for everyone to see(including mine).